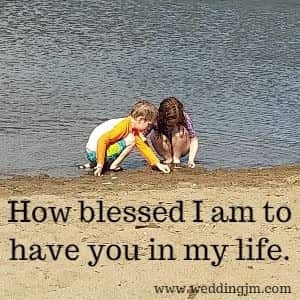 Share these I love you so much quotes with the special person in your life. It is sometimes hard to express how much we love and care for a person, let these quotes help you. 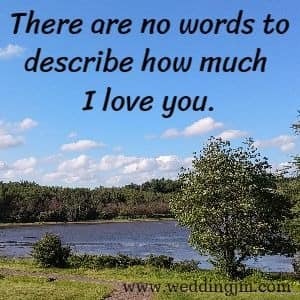 I loved you so much on our wedding day I didn't think I could love you anymore. But here we are on our anniversary and my love for you just keeps getting stronger. The true meaning of love comes from 1 Corinthians 13:4 -7. I love you so much I try every day to demonstrate these words in my life with you: "Love is patient and kind. Love is not jealous or boastful or proud or rude. It does not demand its own way. It is not irritable, and it keeps no record of being wronged. It does not rejoice about injustice but rejoices whenever the truth wins out. Love never gives up, never loses faith, is always hopeful, and endures through every circumstance." Every morning I awake and see you next to me, I thank God for the love that we have. You are the world to me! The best Christmas gift, the best Christmas memory, the best Christmas wish is sharing my life with you. You are my everything today, tomorrow and forever. I love you so much, I say! More than I could have imagined, you make me so happy. No wonder I love you so much! A soul mate you are to me. The love we share is beyond what words can express. Thank you for loving me. It doesn't matter how many times you tell me that you love me. I will always love you more. I love you so much when you are not here my heart aches. I never realized what true love was until I met you. I love you so much I would walk through a snowstorm to be with you. You are my best friend, you bring all the best things out in me. I love you more than you can ever imagine. There are no words to describe how much I love you. I cannot even express how much I love you. My love for you is endless and unspeakable. I love you more than anything else in this world. More than the size of the earth, the distance to the stars and the moon. I love you so much I sometimes feel like my heart will burst and my mind will burst with happiness. May you never want to let go of my heart as you sometimes need to do with my hand. In my life, love is not a necessity, its a want. And I want you in my life for as long as I am on this planet. Love can be like a rollercoaster, this I've seen in the past. But with you our love is more like a levelled road, keeping steady and growing with every minute we're on it. When I say I love you to a person, it usually means that I'm way beyond just loving someone. I'm truely, deeply in love with that person. And that person, is you. I adore you in every possible way. I love everything about you. I even find your faluts irresistible! In every life we find ourselves feeling affection for others. When that affection turns to love, sparks start to fly! Thank you for being on the other end of those sparks. I have always hoped for a love like ours that I can long for when we are apart. What a blessing it is to have you in my life. When we are together I am a better person and I can be sure that that is because of you. You are my rock and for that I treasure your love in me. I can hardly believe how much I love you. Our passion is never-ending and I love that almost as much as I love you. Who are we to have a love so strong and faithful. We are blessed! I wish I could tell you the etend of how much I love you, but words will never be able to express the magnitude. In the simplest of terms, I love you more than you will ever realize. Thank you for being such a wonderful, loving human being capable of making someone love you so much they don't even know how to express it. Sometimes I feel like I'm going crazy. Is it even possible to love someone as much as I love you? I guess so, because here I am. You are my everything, you are my favourite person on this planet. Thats how much I love you. Come to me my love and stay with me forever. For I am here for you, nothing will change that whatsoever.